Signal Strength is a project to advance mobile democracy. 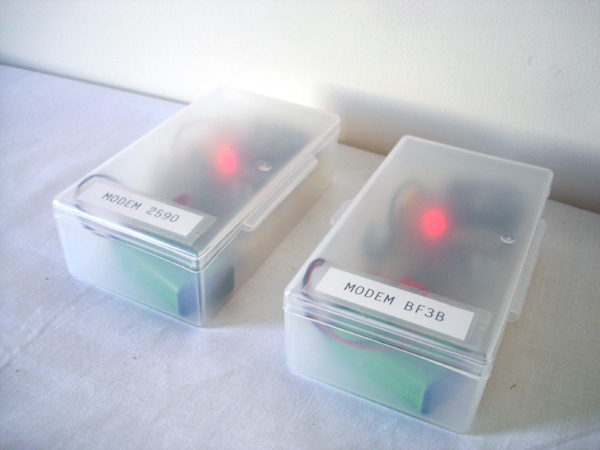 It consists of modules for ad-hoc social networking that let people in an urban area interact offline, leveraging their mobile phones for untraceable communications. This is a hack to your existing cell phone that adds another radio to extend the range and allow you to connect peer-to-peer. It works completely independently of your cell phone provider, has a much larger range than just using Bluetooth, and can connect astronomically more users than just using Bluetooth. Office hours were held at Occupy. Check out the Community Phone Booth! Signal Strength has worked on the following android phones: Samsung 4 Galaxy, Droid Incredible 2, Motorola Droid X, HTC ThunderBolt, Nexus One, and more! (NO) FUN, at Empirical Nonsense, NYC, February 1-March 23, 2019. Pratt Institute Digital Arts and Animation Faculty Show, at Pratt Institute DDA Gallery, Brooklyn, NY, August 27-September 21st, 2018. Radical Networks, with Eyebeam at NYU Poly, Brooklyn, NY, October 24-25, 2015. PRISM Break-up, at Eyebeam Art and Technology Center, NYC, October 4-12, 2013. SIGGRAPH 2012, Los Angeles Convention Center, August 5-9, 2012. Flock House, at DUMBO, Brooklyn, NY, July 10-14, 2012. Wiki World's Fair, Governor's Island, July 7, 2012. Activist Technology Demo Day, with Eyebeam and The Public School NY, January 28th, 2012. Parsons Alumni Reunion Slideshow, Parsons School of Design, October 22nd, 2011. Occupy Wall Street, at Zuccotti Park, October 2, 9, 16, 25, 2011. Maker Faire, with Eyebeam at NY Hall of Science, September 17-18th, 2011. Open Hardware Summit, at NY Hall of Science, September 15th, 2011. Open Studios, at Eyebeam Art and Technology Center, June 17-18, 2011. "Can mesh networks and offline wireless move from protest tools to news?" in NiemanLab, Nov. 10, 2014. "Amelia Marzec, Artist." Les Femmes Folles, June 2014. "Undergrowth," on Radiohive, April 23, 2013. "Inventing the Future," in Localflux, June 22nd, 2012. "Occupy Wall Street Ignites Political Hackathon," by Keith Axline and Bryan Derballa, in Wired, October 7th, 2011.